Dog mushing photos from Alaska's popular mushing races. 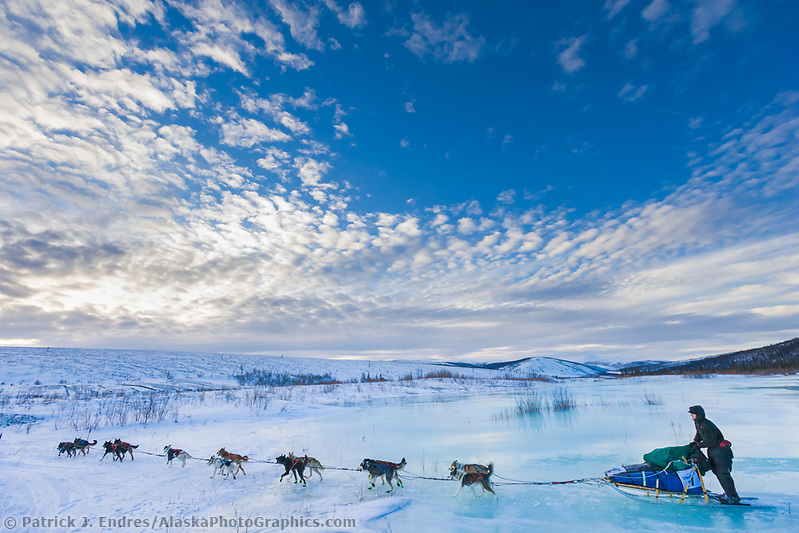 Alaska has a long history of dog mushing. It was, and still is in some places, an important mode of travel during winter months. Although many have switched over to machine powered transportation like snow machines or four wheelers, there are still plenty who choose to run dogs for both practical, recreational, or professional sporting reasons. 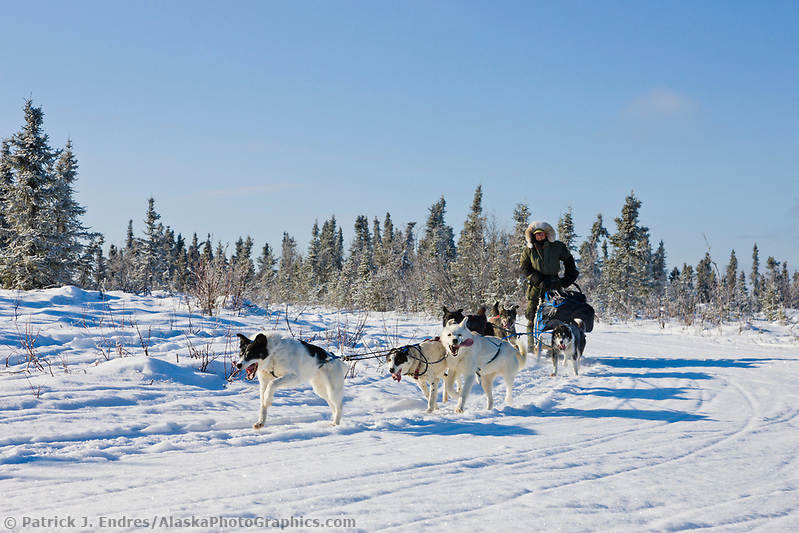 All of the dog mushing photos on this site may be licensed as stock photos for business use, or purchased as fine art display pictures for home or office decor. In accord with the different types of dog, mushing comes a variety of types of sleds. A basket sled, used in dog sled racing, has a bed raised several inches above the surface of the snow. Sprint sleds are often short-bodied basket sleds. In contrast, a toboggan sled has a lower carriage and uses a closed bed, allowing the sled to slide or float over deep snow. Both of these types of sleds have runners which stick out behind the sled, on which the musher can stand. Older sleds relied on hooks attached to the sled with a rope, whereas modern sleds usually include drag and claw brakes built into the sled. 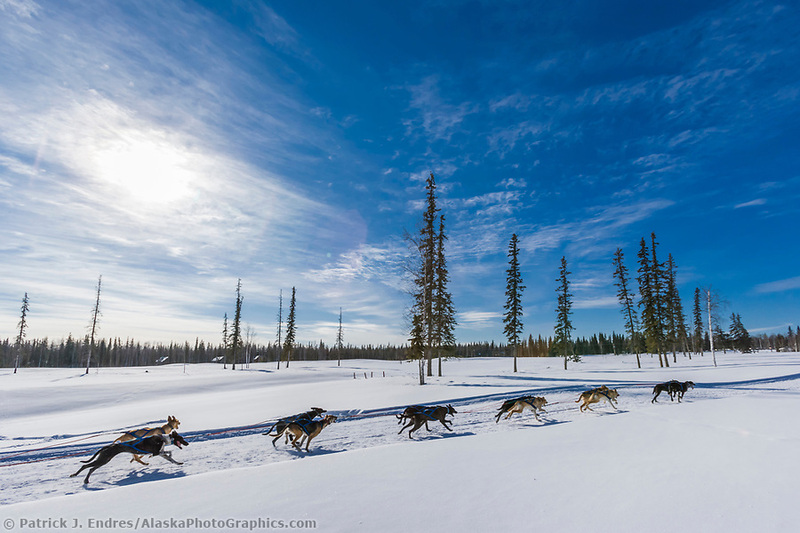 Fairbanks hosts many dog sled races, including the Yukon Quest, the North American, and even the Iditarod which made a historical start in Fairbanks in 2003 due to lack of snow in South-central Alaska. 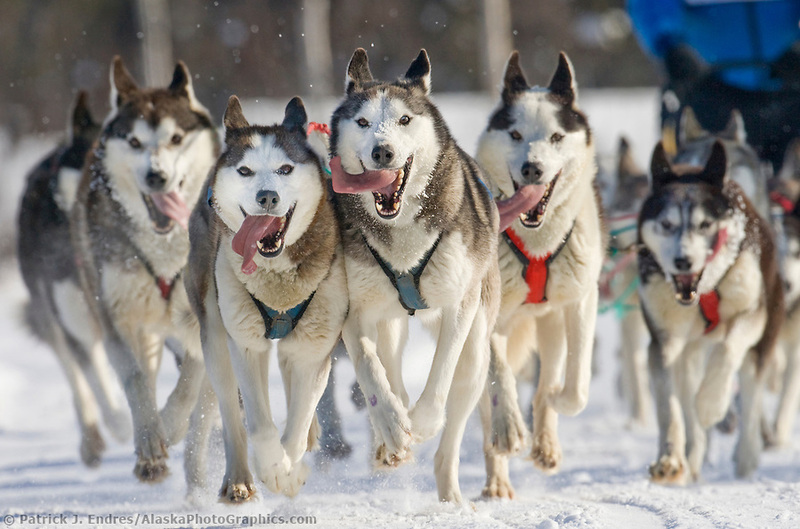 The Yukon Quest dogsled race is sometimes called the “Toughest Sled Dog Race in the World.” The start and finish of the 1000 mile race alternate between Fairbanks, Alaska and Whitehorse, Yukon Territory. Held in February, the racers often face inclement weather. Cold is an understatement, with temperatures reaching 50 below zero and winds up to 100 mph. The race trail crosses frozen rivers, through remote villages, and over four mountain ranges, including the arduous ascent of Eagle Summit in the Steese Mountains. In Fairbanks, the race either starts or finishes on the Chena River between the Cushman Street Bridge and the new Centennial Bridge. The race follows the river to North Pole and may be viewed from many locations where the river passes under other bridges. Proper cold weather sleeping bag. Handaxe with an overall length of at least twenty-two (22) inches/56 centimeters. Veterinary records (loss will incur a two hundred fifty dollars ($250) fine.) The veterinary book must be returned to a race judge upon completion of the race or when withdrawing for any reason. 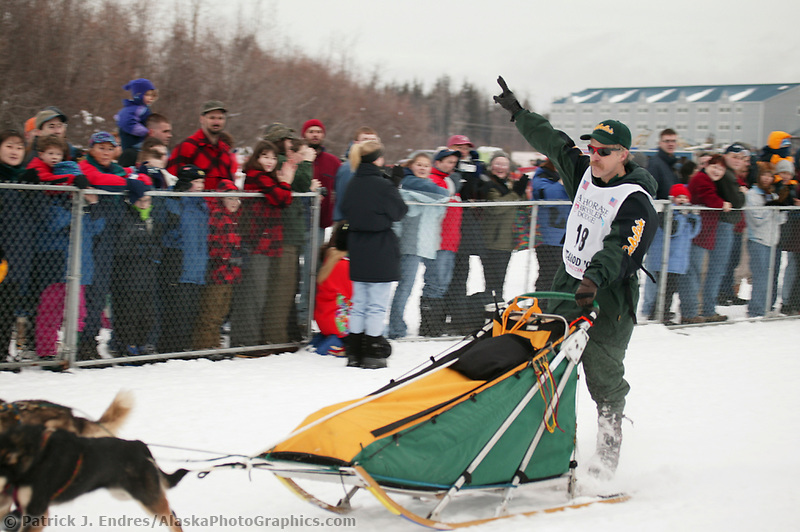 The 2008 All Alaska Sweepstakes dog sled race was the 100 commemorative, marking a milestone in dog racing and painting an intriguing historical picture. 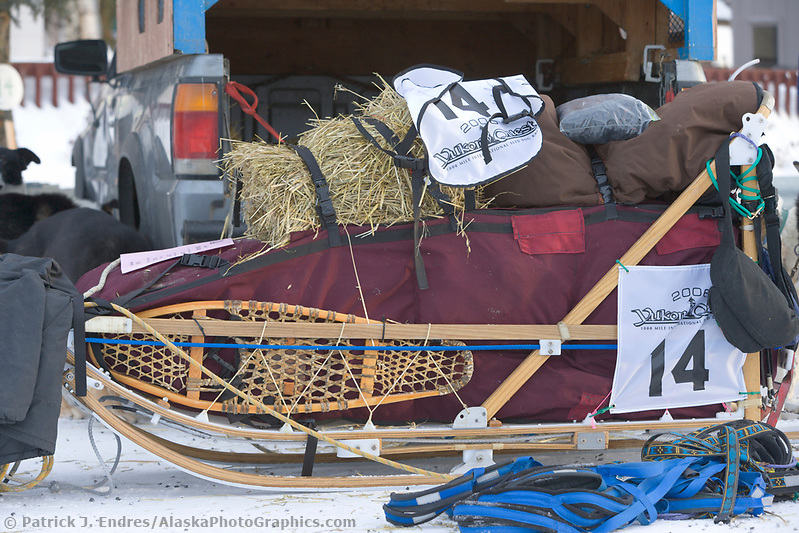 Sixteen mushers participated and the $100,000 purse went to the exclusive first place position! Mitch Seavey won the 400-mile race in a record time and was followed in second by Jeff King, just 10 minutes behind, and Lance Mackey took third. 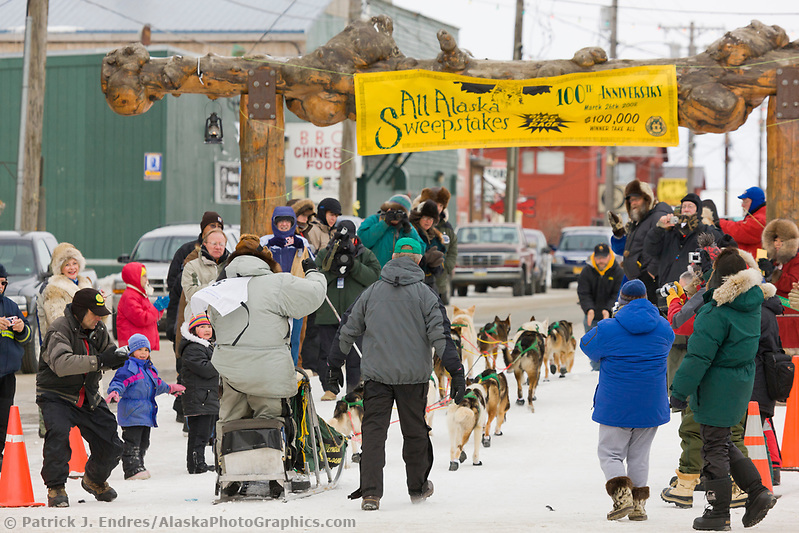 The race is held in Nome, Alaska. The North American sled dog race has a different spirit than the Iditarod and Yukon Quest because it is a series of sprint races. That is not to say it is easy! 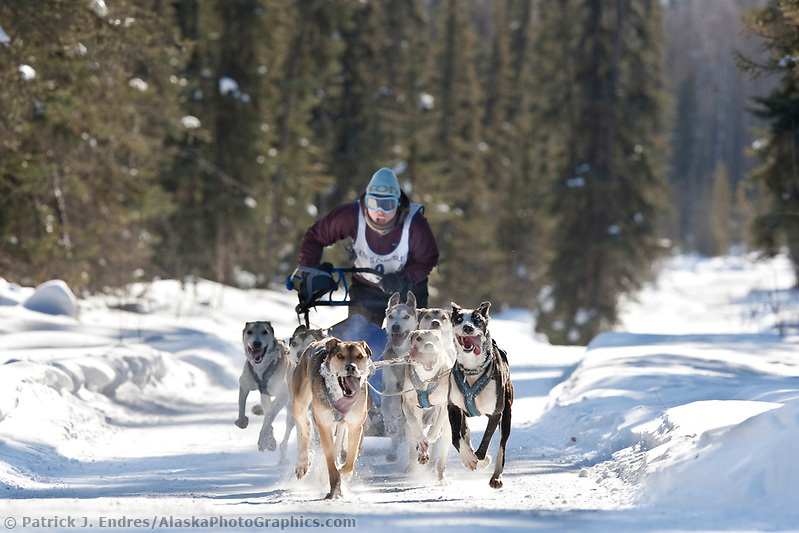 The race attracts top sprint mushers from around the world. 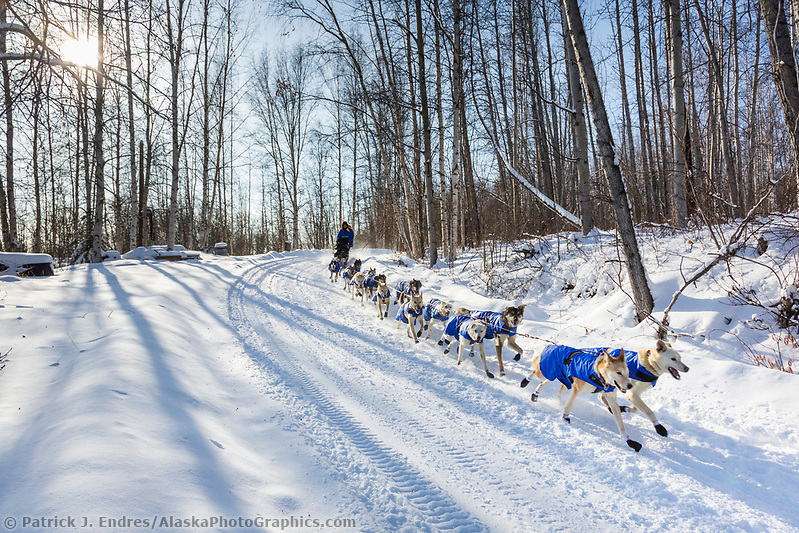 The Open North American is a combined three-day race, which begins in March from downtown Fairbanks, Alaska. The first two days consist of 20-mile heats, and the third day hosts 30-mile heats. Times from the combined races reveal the winner. The Limited North American Championships (LNAC) is the premiere limited sled dog sprint race in the world, attracting top sprint mushers from North America and beyond. 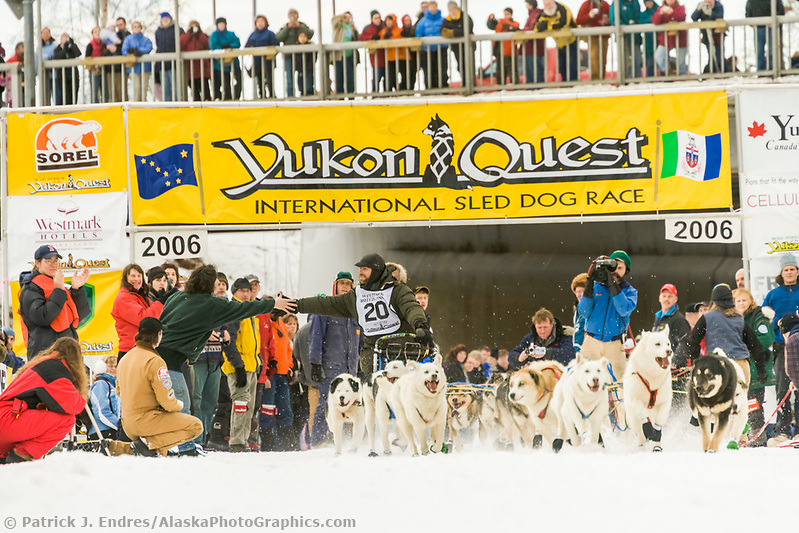 The three-day race is run every year in March from the Jeff Studdert Race Grounds in Fairbanks, Alaska. The term “limited” refers to a limit to the number of dogs in a team that may be run in a given class; the race includes 8-dog, 6-dog, and 4-dog competition, and skijoring with one, two, or three dogs. Many residents of Alaska mush dogs for fun and pleasure, to run a trap line, access areas for hunting, and an increasing number of people are offering dog sled rides to tourists that come visit Alaska. A team of dogs requires training, consistent care, attention and exercise year round. The joys of being in the Alaska wilderness behind a quite team of dogs, hearing the patter of their feet and sounds of their harness–away from snowmachine smoke and noise–is a grand experience.